We’ve improved on the humble shoe liner! Our latest SockShop Seamless Bamboo Shoe Liners (in a twin pack here) are gentler, smoother and more comfortable than cotton equivalents, benefitting from bamboo fibre’s natural silkiness. 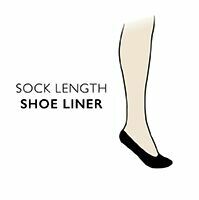 The seamlesss toes for smooth seams means these liners won’t have uncomfortable ridges to rub feet in tight shoes. Bamboo makes our liners naturally more able to absorb moisture too, keeping your feet drier and healthier, particularly since it’s also naturally antibacterial. Astoundingly, bamboo's unique micro-structure gives it the ability to regulate temperature keeps feet cooler in hot weather and yet, warm when it turns colder – it’s true – try it for yourself!